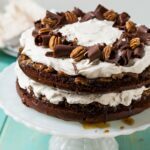 The combination of praline, chocolate, and whipped cream in this Chocolate Praline Layer Cake makes for a truly spectacular southern dessert. 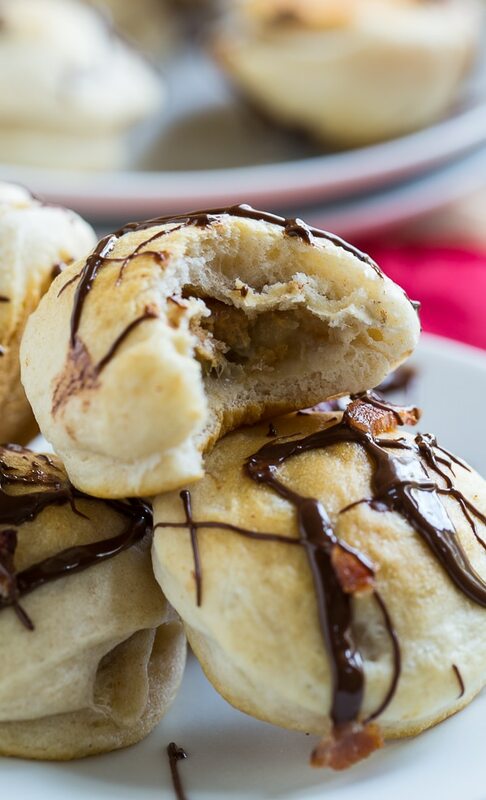 It’s easy enough to make for potlucks, but elegant enough for special occasions or holidays. This cake won the Pillsbury Bake-Off in 1988 and all these years later, it’s still a winner. An easy praline mixture is made from butter, pecans, brown sugar, and cream and then poured into the bottom of two cake pans. The cake batter, which is a doctored up Devil’s Food Cake Mix, goes on top. When you flip the bakes cakes over, a little of the praline mixture oozes down the sides creating a dramatic effect. A thick layer of fresh whipped cream is sandwiched between the layers and another thick layer is spread on top. Love that you don’t need to mess with frosting the sides. To finish it off, chocolate curls and pecan halves are arranged on top for decoration. 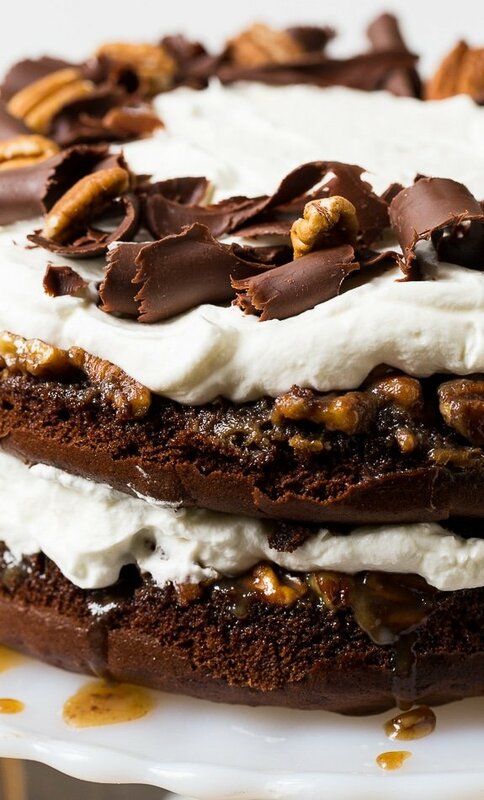 Chocolate Praline Layer Cake makes a stunning presentation with very little effort. In a small heavy saucepan, combine butter, 1/4 cup whipping cream, and brown sugar. Heat over medium heat, stirring frequently, until butter is melted. Evenly divide butter mixture between 2 9-inch cake pans. Sprinkle evenly with chopped pecans. In a large mixing bowl, combine cake mix, water, oil, and eggs. Beat for 2 minutes at medium-high speed. Carefully spoon batter into the 2 cake pans. Bake for 35 to 40 minutes, until cake springs back when lightly touched in middle. To make topping, in a small saucepan combine 1/2 cup whipping cream, cornstarch, and 1/4 cup sugar. Heat over medium heat, stirring constantly until mixture begins to simmer. Immediately remove from heat and pour into a bowl. Let cool to room temperature. Place a mixing bowl and whisk attachment for electric mixer in the freezer of refrigerator. Once cornstarch mixture has cooled, remove mixing bowl and whisk attachment from freezer, add 1 1/2 cups very cold whipping cream to the bowl and beat until it starts to thicken. Gradually add cornstarch mixture. Turn mixer to high and beat until cream is very thick. Beat in vanilla. To assemble, place 1 layer on a cake stand pecan side up. Cover with half of the whipped cream. Top with second layer, pecan side up and cover with remaining whipped cream. Decorate with pecans and chocolate curls. 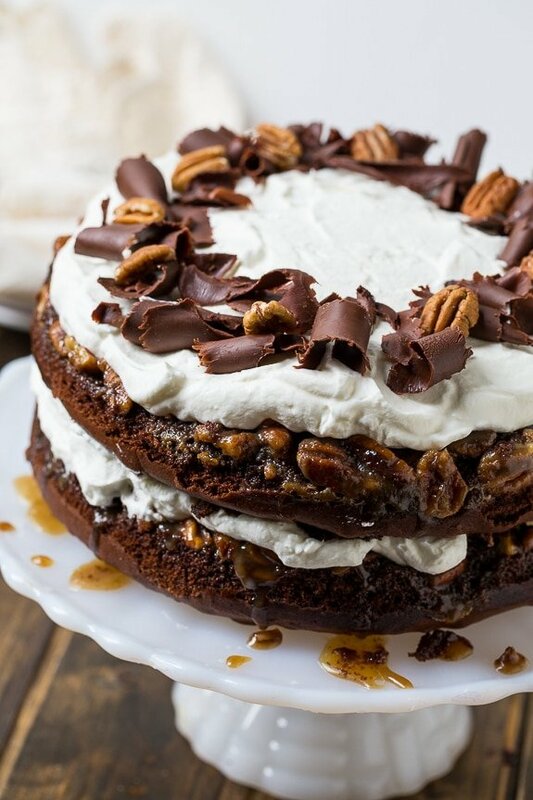 This entry was posted in Cakes, Desserts and tagged cake, chocolate, pecans. Bookmark the permalink. I want to make this for a Crawfish Boil Party, but won’t have time in the afternoon, could I make it in the morning and rely on it to keep for several hours until the party? I made this cake for guests and it was so wonderful! 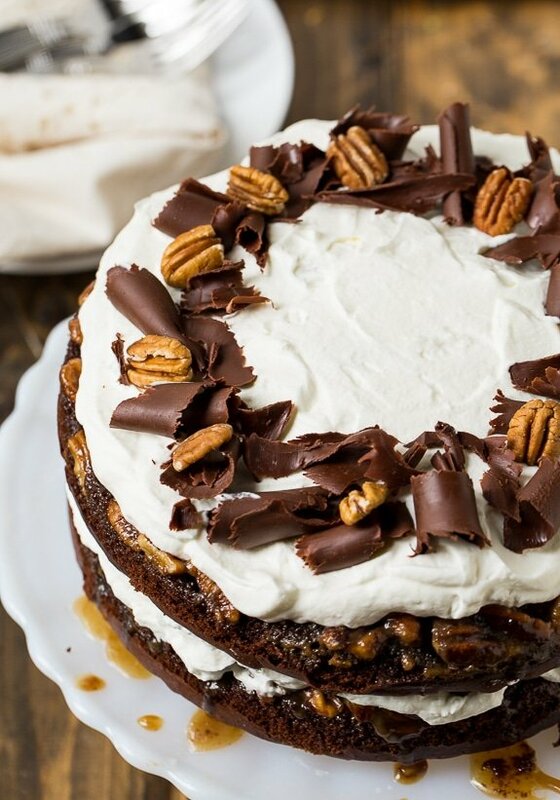 This cake looks mouthwatering delicious! This looks crazy delicious! I feel this urge to slice right into it and dig in. Beautiful! 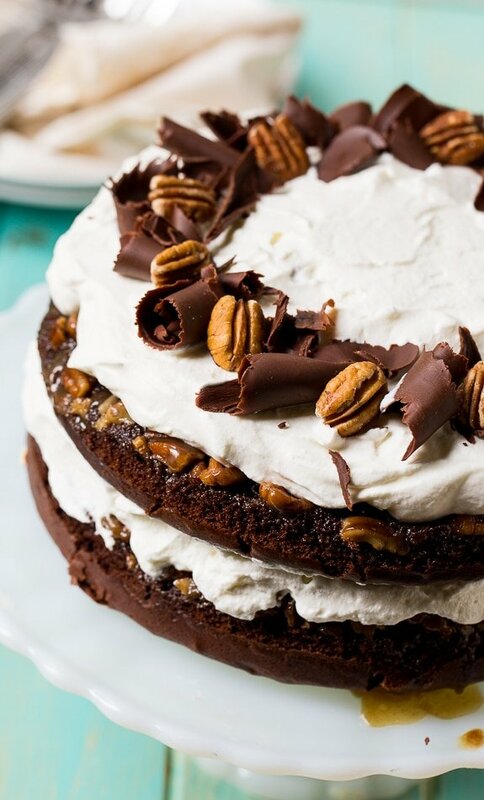 Chocolate praline cake! I don’t know if it looks or sounds better! This cake is absolutely stunning, Christin! I love the gorgeous layers. And that topping is just calling my name! Yum!